AMHO seeks to build on the progress that has been made in recent years to support the implementation of a stronger supportive housing system in Ontario. Housing has long been recognized as a key social determinant of health. For those with mental health and addiction issues, supportive housing is particularly necessary to support and maintain their recovery. However, in Ontario, lack of investments in this sector has resulted in inadequate supply and long wait lists. In Toronto alone, more than 11,000 people are on the waitlist for supportive housing. Supportive housing helps many Ontarians living with mental illness or addictions to live well in the Community. The stability of a home and availability of support services when needed are the foundation for better health. They are also the foundation of a more efficient and cost-effective healthcare system because research demonstrates that people are less likely to use hospitals and other costly emergency services when they have a stable place to live. Supportive housing helps Ontarians living with mental health or addictions issues to achieve their recovery and live a full, productive and independent life with as much, or as little, support as they need. For many, supportive housing is the difference between a home and homelessness. The Government of Ontario has committed to ending chronic homelessness by 2025. To reach that goal, the government will need more affordable rental housing and more support services. AMHO, in collaboration with partners and its members, seeks to build on the progress that has been made in recent years to support the implementation of a stronger supportive housing system in Ontario. Building on this work, AMHO has also be leading research regarding promising practices in supportive housing across Ontario, to facilitate knowledge sharing and identify how providers are meeting unique challenges. This is a resource guide developed by Addictions and Mental Health Ontario, CMHA Ontario and the Wellesley Institute. 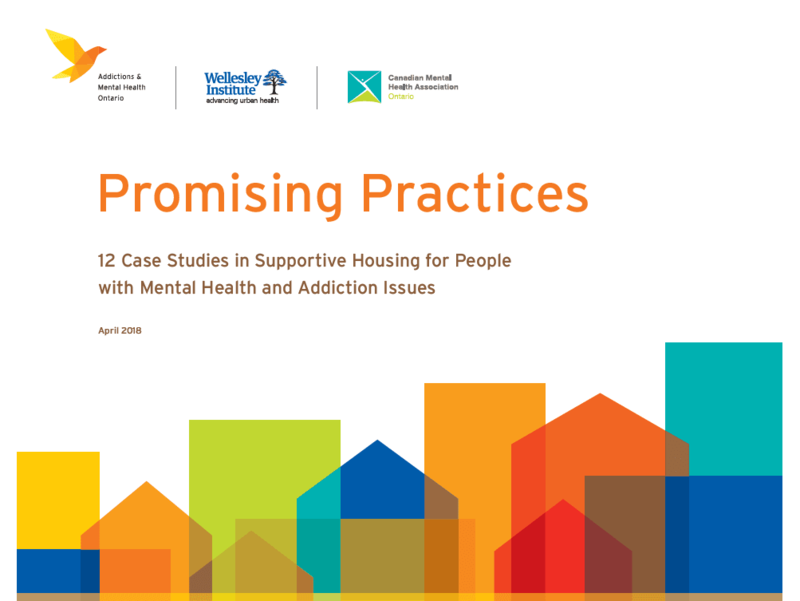 The guide shares the innovative ways that twelve supportive housing providers across the province have overcome challenges and identifies three main areas for system reform. The timeline below outlines key points in this progress and how this has led to AMHO’s continued work today. This report identifies supportive housing as essential to meeting the goal of ending homelessness. The Ontario government responded to this report by adopting a goal of ending chronic homelessness within ten years. Read it now. This update to the strategy makes supportive housing one of its main priorities, setting out principles and included commitments to significant additional supportive housing and an interministerial policy framework. In 2015, the Ministry of Housing (MOH) announced that it had set an ambitious target to end chronic homelessness in ten years. Given that people who are homeless are more likely to experience mental health and addiction issues, part of that Ministry’s plan needs to include strategies for addressing the support needs of this population. In recognition of this, the Ministry in March 2017 announced they will be increasing their operating funding for housing assistance and support services by $100 million annually, ramping up to 2019/20. This funding is expected to help 6,000 individuals and families across Ontario. Read it here. 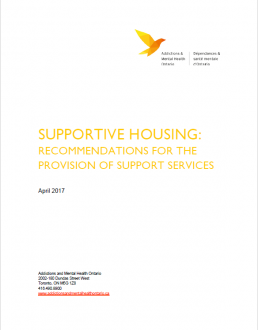 The Mental Health and Addictions Leadership Advisory Council Supportive Housing Working group released their Supportive Housing strategy in 2016, which recommends that a minimum of 30,000 additional supportive housing units are required to meet the need for those with mental health and addiction issues over the next decade (2015-2025). The Ontario Government has recognized this need. Both the Ministry of Health and Long Term Care (MOHLTC) and the Ministry of Housing (MOH) have recently announced increased investments into the supportive housing sector. Though the investments are a welcome start, significant additional investments will be required to meet the 30,000 target by 2025. Read it here. The Framework is the product of ongoing collaboration and is intended to help foster a coordinated system where provincial ministries, local entities (e.g., Service Managers, Local Health Integration Networks, MCSS Regional Offices, MCYS Regional Offices and lead agencies and Indigenous organizations), housing providers, community agencies and people living in supportive housing work together towards a common vision and outcomes. This Best Practice Guide is a companion document to the Supportive Housing Policy Framework and is intended to be a resource for all individuals and organizations that are involved in supportive housing and related services/systems. Read it here.